Making every single thing our family eats from scratch is a lofty goal — but it's one I've never had. Are you surprised? The only way I could realistically make everything from scratch is if I severely limited our choices. Since we love variety, that probably wouldn't go over too well. As much as I love sourcing and cooking real foods, I don't want to (and can't) spend my every waking moment in the kitchen. Therefore, I have to choose carefully what I'm going to spend my time on, because spending my time on everything is impossible. I am a Paleo baker, so any cookies, crackers, or muffins we have are made from scratch with coconut flour and/or arrowroot powder. Paleo baking has actually been a convenient option for me because I don't have to worry about soaking or sprouting time or keeping a sourdough starter alive. This allows me to ditch a lot of the planning ahead and simply bake when I get the urge. Also, it is a given that we are eating a lot of quality pastured meats, organic vegetables, traditional fats, and raw dairy. Following a Nutritional Balancing protocol means that our meals are most often simple preparations of meat with lots of veggies. The basics in your home might include any or all of the techniques taught at Traditional Cooking School: sourdough, making kefir, yogurt, and/or cheese, a lot of lacto-fermentation, sprouting grains and grinding your own flour, dehydrating and food preservation, or any combination of these and more. You decide which foods are a priority for you to make from scratch and which healthy convenience foods might serve you well, pick up the slack, or give you a much-needed break. If I was making everything we eat from scratch, I would be utterly exhausted and never spend time with my husband, sit down to read a book to my kids, clean the toilets, or have time to binge-watch Downton Abbey. 😉 So I rely on some store-bought convenience foods* to make my life just a little bit easier and more fun. It's filtered water or sparkling mineral water for us 90% of the time, but sometimes we want something flavored and bubbly. Zevia Zero-Calorie Sodas — My husband is still not a fan of kombucha, so these keep him from reaching for a conventional soda. Live Kombucha Sodas — Flavored like Coke, Dr. Pepper, ginger ale, orange soda, root beer, or Sprite, these probiotic drinks use all-natural ingredients and pair perfectly with pizza! Honest Kids Juice — Organic juice diluted with water, these are handy for picnics and hikes. We reach for crispy nuts, low-glycemic fruits and smoothies, nut butter, and raw cheddar for snacks most days. My son and I are both healing from adrenal exhaustion, so it is important that we keep our blood sugar stable. I never leave the house without a snack in my purse for us, because when that feeling strikes, we NEED something fast. These snacks are my go-to for those times, travel, park playdates, or when I run out of everything else! Mamma Chia Chia Squeeze — So easy to transport! KIND Bars — Our favorite flavors are Vanilla Almond and Dark Chocolate, Nut, and Sea Salt. I try to limit these to no more than once per week since they contain a lot of nuts which have not been traditionally prepared. Brad's Raw Leafy Kale or Rhythm Superfoods kale chips — Although my family prefers my homemade kale chips, I actually prefer the taste and texture of these. Against The Grain Gourmet frozen pizzas** — After trying every frozen, gluten-free pizza on the market, we found this grain-free one to be the best of all. It is made of whole food ingredients and tastes amazing. Fridays are Family Movie and Pizza Night at our house. This is my night off each week, and I look forward to it! My one complaint about this pizza is that it is made with canola oil, but the company is very clear that it is non-GMO. I'm okay with it since we're eating it just once a week. Against The Grain Gourmet baguettes** — Same ingredients as the pizza crust in a chewy baguette! These are pricey in comparison to bakery baguettes, so we don't have them often. When we do, we love dipping them in seasoned olive oil. Applegate Farms hot dogs and lunch meats — Convenient for days when I need the kids to make lunch for us. I prefer to buy most of our produce fresh and in season, but I also love taking advantage of quality frozen vegetables since no nutrients are lost. It's also nice to have the option of purchasing pre-washed/pre-chopped veggies. For things like cauliflower and spinach, it's worth it to me to spend the extra money for something that's washed and ready to go than to do that step myself! Earthbound Farms organic washed spinach — I buy this at Costco, and it is very economical. We take advantage of these convenient foods often because I believe they are higher quality than what I can make or obtain regularly. Maple Hill Creamery plain, full-fat yogurt — Made from 100% organic and grass-fed milk, it is actually cheaper for me to buy this yogurt by the quart than to make my own. Plus, my family greatly prefers thick yogurt to my yogurt, which tends to be runny. We sweeten our yogurt with vanilla stevia. Kalona Supernatural Heavy Whipping Cream — Our local farm does not always have cream in stock, and it's very expensive when they do. We love this great-tasting cream, and it makes good butter too! Kalona Supernatural Sour Cream — Again, since I can't get cream regularly or affordably, this is the next best thing. I love that it's not made with carageenan, which is common even among organic dairy products. Trim Healthy Mama chocolate chips — stevia sweetened, no sugar and no fillers! Natural Value Coconut Milk — My homemade coconut milk isn't thick enough to produce consistent coconut cream, so I buy this canned coconut milk for that purpose. *I am not, by any means, claiming that these foods are perfect or that they should be eaten regularly. If you are not comfortable with any of the foods listed, that is totally fine! **I recently called Against the Grain Gourmet to ask that they use a healthier oil, such as coconut or avocado, in their pizzas. They informed me that it is a suggestion they receive quite often and are taking the customers' requests seriously. 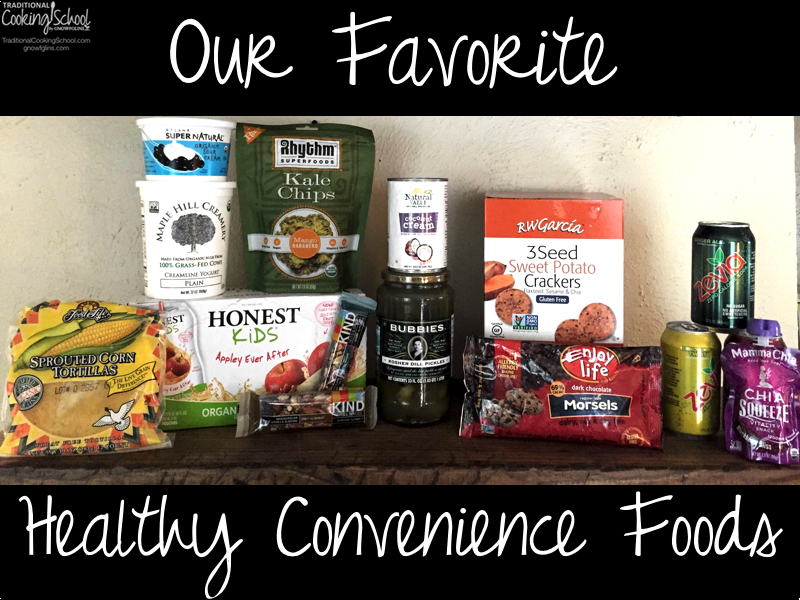 What are your favorite *healthy* convenience foods? Great post!!! It is hard to do everything from scratch and it helps to have healthy alternatives when one is in a bind. I also purchase organic greens. I love to grow our own but I can’t always commit to growing them year ’round. I have also purchased the large bags of frozen veg from Azure. And we love bubbies!! I use their pickles and sauerkraut. Another fav is also from Azure: fermented beets from Oregon Brine Works. They have other products as well but we like those the best. I have been using them when I don’t have time to make my own. Thanks for the fermented beets suggestion, Jenny. I’m always curious about what others are buying from Azure! I recommend artisanbreadinfive.com. I’ve made most of their recipes with gluten free flours. I own two of their cookbooks, and they’re all delicious. I’ll have to look that up, Thomas! what about Costco’s pistaschios? they are good and 20 dollars, I believe, for two lbs. – I’m a Zevia fan, too, although I only drink it on occasion. – Organic pasta sauce from Trader Joe’s, I mix it with sauteed veggies and spoon over bean based pasta. – Love Maple Hill yogurt, too, when I’m in the mood for something thicker than my homemade kefir. – Amy’s gluten free frozen dinners when I’m really in a bind for time. They are one of only a few brands that don’t use crazy preservatives or plastic trays. – I buy Beanitos and organic salsa when inn in the mood for chips and salsa. I’m to both corn, gives me flu like symptoms. – Larabars (I haven’t tried Kind Bars yet) although they don’t use sprouted nuts either. – Some of my convenience foods are of my own making. I’ll cook a sizeable amount of meat at the beginning of the week and keep in the fridge to eat on the side of a veggie dish. When I make broth I freeze it in tall mason jars. After I soak almonds, I coat them with organic wheat free tamari and spices and then dehydrate them; makes a great handy snack. Plus I keep 1 cup jars of wild rice in the freezer that I’ve sprouted and cooked. There may be more but those are all I can think of for now. I would swap out the vegetable chips cooked in canola oil for Honest sweet potato chips cooked in coconut oil.